When Coral Gables and Miami natives hear the name “Christy’s,” thoughts of the holy grail of fine-dining immediately surface in their minds. This quaint, upscale steakhouse sits on an unassuming corner on Ponce De Leon Boulevard right across the street from the Coral Gables Courthouse, just blocks away from trendy Miracle Mile in downtown Coral Gables, FL. But don’t let the lack of a pretentious façade fool you, Christy’s is everything you would ever expect from the finest food, drinks, and service. The moment that you walk in the front doors of this iconic establishment, you will know that you are in the right place for your romantic evening/night on the town/delicious steak dinner/special occasion. The ambiance is classic; including a comfortable piano bar adorned with authentic pieces of Cuban art on the walls. The dining room is quiet and personal, and the service is second to none in an often forgotten art kind-of-way; especially when compared to the many impersonal chains that line the streets just a few blocks away. All of these quality elements–ambiance, fine food, top-notch service–contribute to the success of the restaurant, which is now celebrating its 35th Anniversary. In celebration of 35 years of creating unforgettable memories in the Coral Gables community, Christy’s is offering a fantastic special menu throughout the month of November this year. For only $35, you can savour one of Christy’s classics, along with one of their famous Caesar salads. Entrée choices include: Filet Mignon, Herb-Crusted Seabass, or a Rack of Lamb. 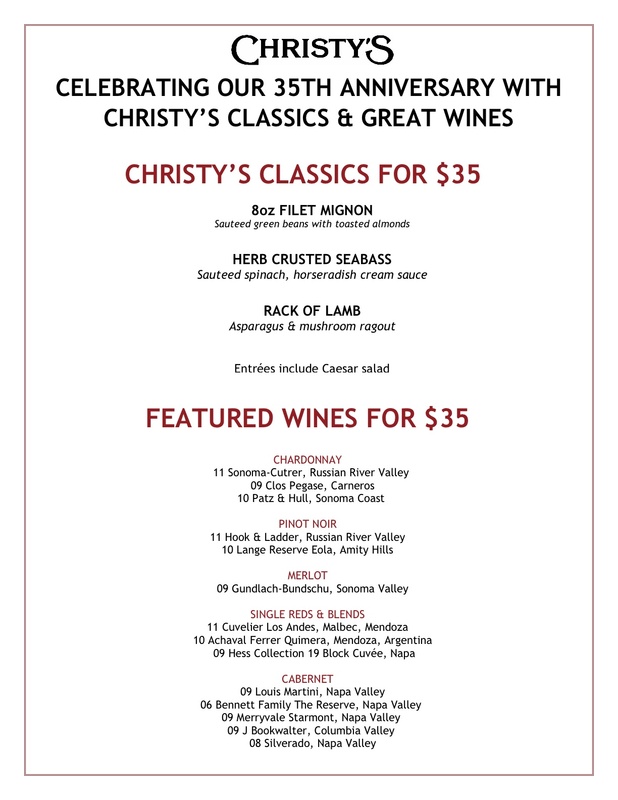 In addition to the premium entrée options available throughout the month, Christy’s is also offering a selection of premium wines for only $35 a bottle. This kind of deal is practically unheard of in the fine-dining world, but it is how Christy’s is celebrating with the community that has supported her for 35 years. For more information, or to make reservations, you can visit the Christy’s website. So, I’m going to have to plan a trip down in November to take advantage of this!